There are many factors, which affect the quality of wool fabric. The kind of sheep from which the wool is obtained, its physical condition, the part of the sheep from which the wool is obtained, and the finishing processes are some of the factors, which affect the properties of wool fabric. Composition: The chief constituent of these fibers is the protein substance called Keratin. Chemically these proteins contain 5 elements: carbon, hydrogen, oxygen, nitrogen, and sulfur. This is the only animal fiber, which contains sulfur in its composition. Strength: Wool is the weakest of all natural textile fibers. Wool fabric is strengthened by the use of ply yarns. A hard-twisted two-ply yarn may be regarded as an assurance of durability. Tightly twisted single yarns also make a strong fabric. Elasticity: Each wool fiber is a molecular coil-spring making the fiber remarkably elastic. Depending upon the quality of wool, the fiber may be stretched from 25 or 30 percent of its natural length before breaking. This characteristic reduces the danger of tearing under tension and contributes to free body movements. Wool fibers can be stretched up to 50% when wet and 30% when dry and still bounce back to their original shape when stress is released. To preserve this natural elasticity, wool garments should be hung properly after wearing and allowed to relax sufficiently to regain their shape. Resilience: Wool fabrics resist wrinkles. Wool is the most resilient fiber because it has a natural crimp that helps it keep its shape. Wrinkles disappear when the garment or fabric is steamed. Good wool is very soft and resilient; poor wool is harsh. When buying a wool fabric, grasp a handful to determine its quality. If the fabric retains the wrinkles and feels stiff, this may indicate an inferior grade of recycled wool. Drapability: Wool’s excellent draping quality is aided by its pliability, elasticity and resiliency. Drapability is one of the competitive features of wool fabrics over many man-made fibers. Heat Conductivity: As wool fibers are non-conducts of heat, they permit the body to retain its normal temperature. Wool fabrics have built-in climate control. Wool is a natural insulator and keeps the bodywarm in winter and naturally breathable to keep the body cool in summer. Wool garments are excellent for winter clothing. The scales on the surface of the fiber and the crimp in the fiber create little pockets of air that serve as insulative barriers and give the garment greater warmth. Light weight wool of sheer construction can be comfortable for summer wear in suitable garment styling because of its thermostatic quality. Absorbency: Wool fiber is the original wicking fiber. Initially, wool tends to be water-repellent. The water lies on the surface of the fabric, which can be readily brushed off. However, once the moisture seeps between the scales of the fiber, the fiber’s high degree of capillarity will result in ready absorption. Wool can easily absorb up to 30% of its weight in moisture without feeling damp or clammy. Consequently, wool fabrics tend to feel comfortable rather than clammy or chilly. Wool also dries slowly. 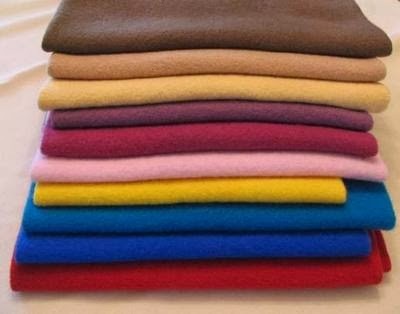 The absorbency of wool fabricsmakes the fabrics temperature regulator since the fabrics can protect the body in both cold and warm conditions. Wool fabrics create a balancein moisture conditions by absorbing the moisture from the atmosphere ofgreater humidity and release it to the less humid environment. These characteristic makes wool fabrics comfortable to wear in warm and cold weather. Cleanliness and Washability: The wool fabrics adheres dirt and requires to be thoroughly cleaned. Care should be taken while launderingas the fiber is softened by moisture and heat which results in shrinking and felting of the fabrics washed. Wool fabrics temporarily lose about 25 percent of their strength when wet. Thus wool fabrics should never be pulled or wrung while wet. They should be lifted and squeezed. Reaction to Bleaches: The chlorine bleaches like sodium hypochlorite are harmful for the wool fabrics. They can be safely bleached with hydrogen per oxide or sodium per borate. Shrinkage: The wool fabrics shrink when washed. The fabrics which are dry-cleaned shrink less. Effect of Heat: Wool becomes harsh at 212°F (100°C) and begins to decompose at slightly higher temperatures. It will scorch at 400°F (204°C) and will eventually char. Wool fiber does not burn freely when touched by flame. Wool chars and stops burning when it is removed from the source of fire. Wool is self-extinguishing and does not support combustion. Effect of Light: Wool is weakened by prolonged exposure to sunlight. Resistance to Mildew: Moisture content is the main factor for the development of mildew on a fabric. Wool is not ordinarily susceptible to mildew as the fabric does not absorb moisture easily. However, when the fabric is left in a damp condition, mildew develops. Resistance to Insects: Wool fabrics are especially vulnerable to the larvae of moths and such other insects as carpet beetles. Reaction to Alkalis: Wool is quickly damaged by strong alkalis,which make it essential to use a mild soap or detergent when laundering wool fabrics. Reaction to Acids: Although wool is damaged by hot sulfuric acid, it is not affected by other acids, even when heated. This property permits wool to be carbonized without damage. Affinity for Dyes: When wool fabrics are dyed, the dye reaches the core of the fiber and bonds permanently. Wool absorbs many different dyes deeply, uniformly and directly without the use of combining chemicals. Because of their high affinity for dyes, wool fabrics dye well and evenly. Resistance to Perspiration: Wool is weakened by alkali perspiration. Woolen garments should be dry-cleaned or washed with care to avoid deterioration and odor. Perspiration generally will cause discoloration.